Our much loved Clip Clop character is the star of this Musical Activity Gym, encouraging baby to play, listen, look and touch. The soft padded mat ensures baby is comfortable as they go exploring with Clip Clop and his friends. When baby pulls the musical Clip Clop a gentle tune sounds, demonstrating cause and effect and stimulating auditory skills. 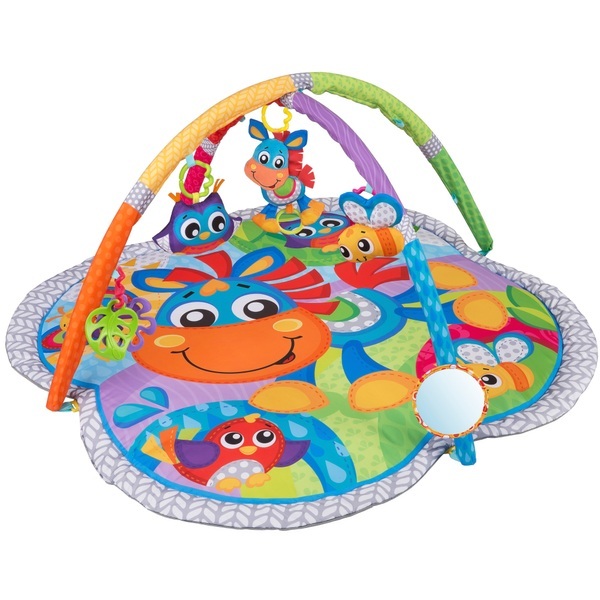 Bright colours and baby’s image reflect in the mirror teaching self recognition while four detachable hanging toys entice baby to reach and grasp strengthening gross and fine motor skills. The soft leaf and flower teether encourages exploration with their mouth, at the same time soothing sore gums.